Major League Baseball has crawled out of its winter hibernation and its participants have begun stretching, yawning and wiping the crust out their eyes. Spring Training baseball has begun in Florida and Arizona, new players are meeting their teammates and donning new threads, pitchers are loosening up their arms and getting injured already, hitters are getting back in the swing of things and, of course, the always anticipated annual rite of spring has begun: the publishing of new baseball books. I picked up the annual Baseball Prospectus book a couple weeks ago and I'll have plenty to say about it soon. Also, a writer who began with the BP conglomerate, Jonah Keri, has released his first book on his own and its getting great reviews already. 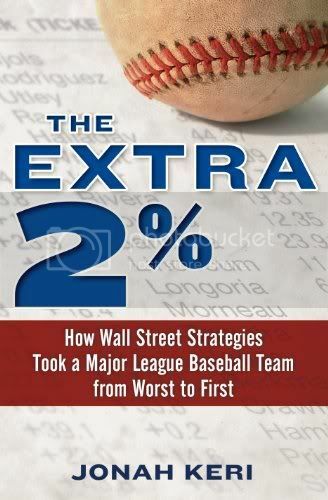 The book is titled The Extra 2%: How Wall Street Strategies Took a Major League Baseball Team from Worst to First detailing the extraordinary turnaround of the Tampa Bay Rays from pathetic embarrassment to pennant-winning AL East powerhouse regularly competing with the league's most powerful and resource-rich organizations. I've only read the opening pages thus far but the writing is great; Keri has a reputation for being a wonderful writer, and the book is a bit like the Moneyball story which means I'll probably become a Rays fan after reading it. Admittedly, for me the prominence of Wall Street tactics and ex-Goldman Sachs honchos within the story is a bit discomforting because of my violent feelings toward that sector of society these days but it is a baseball story above all and Keri has denied that the Rays people had any past involvement in the shady tactics that murdered the economy. Besides that, Jonah is a cool guy, I've had lunch with him once before. About 5 or 6 years ago when I was getting college credit as an intern with Baseball Prospectus (thanks to my pal Jay Jaffe), my brother John and I attended a book-signing and discussion upon the release of the big annual book and we got to go out for lunch with the crew of writers afterward. It was a highly interesting, baseball-chatter filled afternoon, and it just so happened that John and I sat at the end of the table next to both Jonah Keri and Nate Silver. Jonah was an extremely nice, humble guy; a Canadian with a deep and sometimes humorous affection for the Expos (which John and I could sympathize with since we'd recently drove to Montreal for a weekend to take in a couple games), he was also highly knowledgeable about college basketball and that often snuck into the discussion since it was March. We also talked about the new hardcover book BP had recently written, Baseball Between the Numbers, which Jonah edited. Nate was also a very cool dude. The whiz kid who had developed BP's statistical projection system PECOTA, he is probably the smartest individual I've ever met. He would later go on to leave BP for a pretty famous career as a statistician analyzing political polls. (He accurately predicted the results for 49 of the 50 states in the last presidential election and was even named one of Time Magazine's 100 Most Influential People in 2009---with Bill James himself writing the article.) I remember Nate having the physical quirks and awkwardness of a genius; he would sit in a strange twist with his legs crossed and arms leaning forward. For such a gifted mind, he was a humble and soft-spoken individual. A few years later, big bro John and I went to another signing and Nate, who I hadn't spoken to since that lunch, remembered me. In retrospect, it should come as no surprise because his digital computerbrain probably remembered what hat I wore that day (Padres, actually) and what I had for lunch. You can read more about Jonah's new book here and here, and if you're interested in what Nate Silver's up to these days he's got a blog on the New York Times site. Mostly about politics, sadly. He doesn't touch on baseball too much anymore though he does write about basketball (college and pro) every now and then.